In reviewing more than 4,000 mystery shops and working actively with wineries every day, we’ve heard some remarkable myths out there. Most of the myths we hear are about why it’s a challenge (or ‘impossible’) to sell wine, sell the wine club, or ask people to join the winery mailing list. Since as humans, most of us tend to remember our failures more vividly than we remember our successes, we dwell on all the reasons why we can’t sell. More often than not, we just have to get out of our own way and brainstorm ways to counter the objections, which may be mostly in our heads. Let’s bust these myths and see them for what they really are. In September, Brave & Maiden Estate opened a new winery and tasting room located on its 70-acre estate along Refugio Road in Santa Ynez, Calif. The 46-acre, SIP certified sustainable vineyard is planted to Cabernet Sauvignon, Cabernet Franc, Merlot, Syrah, Grenache and Sauvignon Blanc. Brave & Maiden was established in 2011 by owner Rizal Risjad and his business partner and managing director Jason Djang. Under the direction of consulting winemaker Paul Hobbs and winemaker Josh Klapper, the winery currently produces approximately 3,000 cases annually. Wine-A-Rita mix + wine + ice = a FUN & DELICIOUS frozen wine drink! Boxed mixes for retail sales & bulk for serving. 7 flavors. The next Wines & Vines Packaging Conference will be on August 8, 2019. 1. People aren’t buying because of the economy. This was true in 2009, but today the economy is doing well. Unemployment is so low in California that we have trouble finding staff. People have money and willingly spend it on treats – like our wine. 2. People are sick of hearing about wine clubs. After 4,000 mystery shops, we find that staff presents the wine club about 55% - 60% of the time. This is higher in some markets (Napa/Sonoma) but even lower in other markets. This means about half (45%) or more of the people visiting our wineries aren’t even hearing about wine clubs. And those who are hearing about it, may be sick of hearing about wine clubs that are simply discount programs, when most of our clubs have other wonderful benefits beyond the wine discount. If we’re selling it in a brand-appropriate way, when we tell our guests what’s in it for them and invite them to join our really special club, they will! 3. Wine club members don’t buy. We all know that our club members are our bread and butter because of how much they really do buy. Perhaps not all of our staff understand how important they are. While there are some challenges with space at times, and they may not buy every time they visit, they do bring their friends, take our regular shipments, and we become part of their celebrations. Their friends will join too if we remember to invite them. 4. No one wants to give their email address out, especially to a winery. Most people will sign up to receive an email with at least one business that they love getting updates on. Everyone wants to be an insider, be the first to know about events and new product releases, and get special deals on things they want most. Email is still one of the best ways to do it. As an industry, we do a very poor job of collecting contact data (less than 35% of the time across 4,000 mystery shops). Instead of simply asking for the email address, we need to explain what’s in it for the customer. They will not be able to resist your compelling pitch due to fear of missing out (FOMO). 5. You have to use discounts to sell wine or wine clubs. Tell that to Apple… to Tiffany… to Lululemon… Strong brands tell stories that make people want to be part of something that cool. What stories should we be telling to convince our guests that they want to be part of our story? If we focus on what makes us special and people want to be part of it, using discounts is no longer important or needed to sell our products. 6. People only buy wines that are highly rated. If that’s true, should we go out of business since we don’t send our wines out for ratings? Guests who are focused on ratings are looking for validation that this is a wine they will be proud to serve. But ratings aren’t the only way to validate. These folks will be happy to know which wines are club member favorites or winemaker and staff favorites, which restaurants pour our wines, and any other accolades we can describe. 7. People from no-ship states shouldn’t be asked to join club or buy wine. Maybe they can’t have wine shipped to their home at present, but they have friends and family to send gifts to. They might move to a state where we can ship. They might buy our wine at stores in their home state and that’s good for our brand too. And maybe one day we will be able to ship to Utah. And then there are those dedicated wine buyers who pack wine home with them. 8. Single/young/old people don’t buy. Nor do people with black/brown/red/blond hair. Nor do bald people or people with tattoos. Actually, no one buys anything anymore. Just ask Amazon. We need to remind ourselves and our team not to negatively profile our guests – never judge a book by its cover, and the only way we can find out if they are interested in buying is if we ask enough open-ended questions to figure out their interests. 9. Phone campaigns aren’t important – people don’t want to be called. If it’s your dentist’s office calling to confirm an appointment/checkup, or a random business that you have no relationship with, we probably don’t want to answer those calls. But, everyone one wants to hear from a winery about amazing deals selected just for them. They simply don’t want to be called by someone who doesn’t understand their needs and interests. 10. Incentive compensation by individual team member doesn’t matter. Sure, we’d be happy if we all got paid the same. Including Skippy who just sits in the backroom all day contemplating his navel… The advantage of an individual incentive program is the recognition it gives team members for their efforts and motivates the top performer to keep it up…and it can serve to motivate others. Set up correctly, the incentive should be one that encourages work-friendly competition in order to motivate the team member to do his / her best. The next time you hear an excuse for not being able to sell – in a brand-appropriate way – ask yourself if it’s valid or simply a myth – one that requires each of us to look at the challenge a little differently and find a way to get to YES! 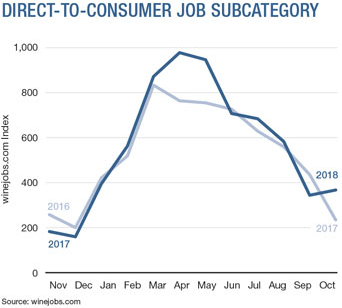 Demand for direct-to-consumer positions, including tasting room and retail staff, strengthened 56% in October versus a year earlier. The subindex rose to 366. 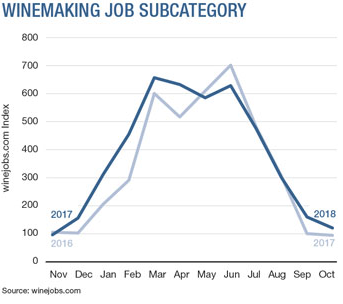 Demand for winemaking positions increased 27% in October versus a year earlier, with the subindex rising to 122. All of the wines had been made at Central Coast Wine Services in Santa Maria, Calif., before the new winery had been built in time for the 2018 harvest. The first harvest day in the new facility took place on Tuesday, Oct. 9. “Our focus is to perfect the wines we currently grow and produce. But we will occasionally introduce new wines that can be grown well on our estate,” said estate director Lesley Ann Couture, adding that annual case production will increase to between 5,000 and 6,000 cases per year in the new winery. White grapes are whole cluster pressed and aged in a combination of stainless steel, new and neutral French oak barrels. Red grapes are destemmed and fermented in 3-ton, closed-top stainless fermentation tanks, undergoing pumpovers once or twice daily before being basket pressed and aged in “varying percentages” of new and neutral French oak barrels. The production facility contains 14, 1100-gallon fermentation tanks and three 1,500-gallon blending tanks. The new location is also home to Brave & Maiden’s first brick-and-mortar tasting room. Previous to the new venue, the winery’s direct-to-consumer (DtC) business was conducted online through the winery’s website as well as through its membership program, which launched in September 2017. Courture said she’s already seen a boost in DtC sales within the few months the tasting room has been open but notes Brave & Maiden sells in the wholesale market as well. She estimates Brave & Maiden’s business breaks down to approximately 60% DtC and 40% wholesale. Tastings at Brave & Maiden are by appointment only, so staff can provide guests with those individualized experiences. She also said that when a guest starts to ask about discounting on wine purchases or future tasting opportunities, that is a good time to “up-sell” the wine club and point out perks of membership. Brave & Maiden’s membership program offers unique experiences, as opposed to discount rates. These include access to the tasting room for complimentary tastings, access to the estate for members-only events and free shipping on all online orders. “A special and unique perk Brave & Maiden offers is an annual room buy out of our private library or courtyard for two hours waived once a year, where members can bring 20 of their closest friends in for wine tastings or bottle purchases,” Couture said, estimating the experience is worth about $500. The Brave & Maiden tasting room uses WineDirect as its POS and CRM software. “We like that you have iPad integration, and since our guests are seated for their tastings, there is an ease with the guest checkout experience,” Couture said. Guests to the Brave & Maiden tasting room receive a varietal-specific glass for each wine poured, using the Riedel Extreme Collection. Couture said after tasting through a number of brands, the Brave & Maiden team decided the Riedel glasses showcased their wines’ aromas and flavors the best. The Alpha Omega Collective is scheduled to open its first tasting room this winter, located at 1245 First Street in downtown Napa, Calif. The space is currently occupied by Capp Heritage; terms of the lease agreement were not disclosed. The Alpha Omega Collective, unveiled earlier this year, includes Tolosa in San Luis Obispo’s Edna Valley, Alpha Omega on Napa Valley’s Rutherford Bench and Perinet in Spain’s Priorat. Westwood Wine hired Nick Woodhams as the winery’s new director of direct-to-consumer (DtC) sales. Woodhams has broad experience in leading luxury wine hospitality, most recently as DtC director for Trinitas Cellars in Napa, Calif. Previously, he served in similar roles for Palmaz Vineyards and Silverado Vineyards, also in Napa.